For better graphics performance, you may want to install NVIDIA proprietary driver instead of the open-source driver in your Ubuntu Desktop. xorg-edgers PPA provides the latest Nvidia drivers available for Ubuntu 14.04 LTS. You can easily install the latest drivers of Nvidia 340 (latest long lived branch), Nvidia 343 (latest short lived branch), or Nvidia 346 (still in beta) from the PPA repository. The PPA added to your system after your clicked the ‘Add Source’ button. 2. If you have “Synaptic Package Manger” installed, start it and after clicking Reload, you can search for and install nvidia-340, nvidia-343, or nvidia-346 to install the graphics driver as you want. Replace nvidia-340 with nvidia-343 or nvidia-346 if need. 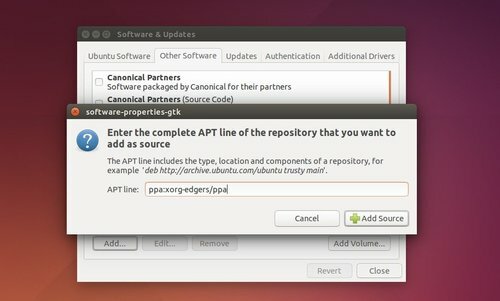 No user responded in " Install Latest NVIDIA Proprietary Drivers in Ubuntu 14.04 "